St Croix Libre – The Havana Libre gets Sparkled! My original intent was to share a recipe for the Havana Libre; a cocktail much like this one but without the Perrier water. I took some time to do a bit of research as I was certain it would be a relative of the Cuba Libre. No? Since I could not find one bit of historical perspective to share with you today it was time to get creative! I was certain that I could weave a tale of travelers to the venerable Havana Libre Hotel in Cuba always having to have this cocktail in hand. Or maybe it came about when Fidel Castro and his forces entered Havana on January 8, 1959 and laid claim to the namesake hotel for his headquarters; maybe it was their cocktail of choice? Since none of that is true I also didn’t feel compelled to use rum from that island and that was a good thing; I’ve found a treasure in some rum from St. Croix! I decided to change it up a bit and add some Perrier Sparkling Water with Lime; something about that bit of fizz I just love and I love Perrier cause it fizzes so well! That they now come with subtle flavors of lime, lemon and grapefruit make them even more perfect for my bar inventory. So, how about we just pretend that a visitor from Havana helped engineer this cocktail after being liberated FROM Cuba while vacationing in St. Croix and that they were the ones who requested soda water from France…that works right? I feel like I just wrote the synopsis for a soap opera! In any event, the Havana Libre has been a summer favorite for years but I believe this St. Croix Libre tops it. Though made with entirely different flavors; it reminds me a bit of a gin and tonic; light on the booze, not too sweet, generous with the water and altogether refreshing. I make my own grenadine syrup and it’s so easy, you should really pitch that bottle of Rose’s (can you say all artificial?) and make your own too; it’s just pomegranate syrup! The folks at Cruzan, pronounced “Cru-Shun,” invited me to sample their Aged Dark Rum. While Cruzan offers many great flavored rums for a reasonable price; I’m more inclined to covet the unflavored varieties; you know, the better to mix with my dear! I received the Cruzan Aged Dark Rum last week and put myself to work sipping and mixing (yes, a VERY tough job!). I have to say that for a $12 bottle of rum I was pretty impressed. A new bottle design combined with a deep, dark penny color has it looking like a dark rum but the scent is the first measure of real importance. Very light on the nose with definite caramel tones; it was nice but it was the taste that was most surprising. Both not too sweet or too biting (so typical of many lower priced products) it has a nice mouth feel and offers a slight vanilla flavor. I’ve never been one to enjoy sipping rum but I imagine aficionados would prefer something more complex; for me this seems the perfect mixer for the wealth of rum cocktails that call for fruits and juices. Cost effective but great in a cocktail? The perfect choice for my summer bar! Cruzan Rum has launched a new campaign with a tourism video that invites you to the island of “The Don’t Hurry” – a metaphorical place where life never moves too fast and Cruzan Rum is always within reach. I’m ready! In keeping with Cruzan’s island mentality, we have asked a parrot to tell you where to find the video. I’ll be honest, this is not the prettiest cocktail I’ve ever made; the small amount of grenadine just gives it a pinkish tinge and I wanted more…but I stopped myself from over-grenadining…just a hint of sweet is important; I wasn’t looking for Shirley Temple! It’s easy and refreshing; I think a great addition to my library of summer cocktails! 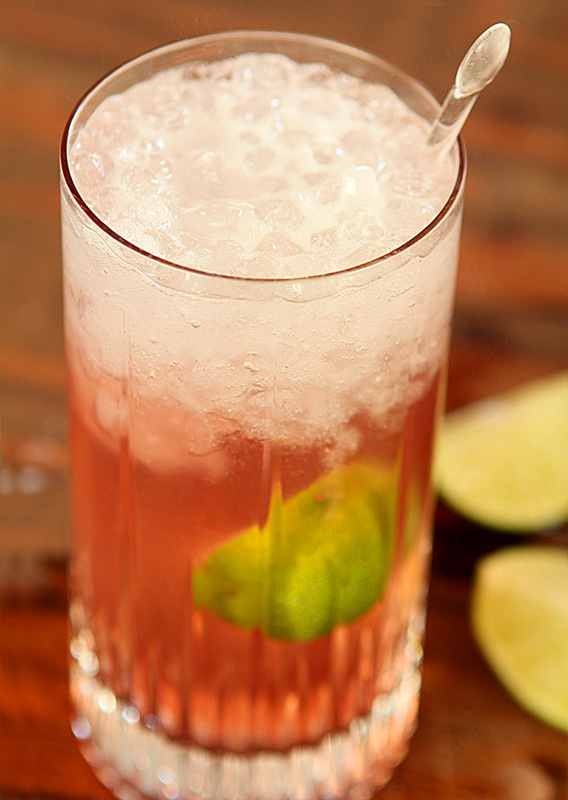 Squeeze a lime wedge in a Collins glass and drop into the glass. Add grenadine and rums, fill with crushed ice, add soda and stir well. I was given samples of both the Cruzan Rum and the Perrier Water however all commentary is my own. Don’t sell yourself short on the color– I think it is delightful and pretty. A great cocktail for a wedding shower perhaps? A Shirley Temple color can look artificial but this is soft and tempting. I’ll be on the lookout for this rum next time I am at the liquor store. Thanks Holly; I will now look at it with renewed respect! You know I adore you right? It’s true…you are SO sweet! Very glad you are my friend. Leave it to you my friend to make the color sound perfect…thanks! I think it’s worth trying Stacy; I never advocate cheap crap but I do advocate not using your best sipping booze for fruity cocktails…save that stuff for on the rocks at most! You are a doll; XOXO back at ya! Cruzan is good stuff. In fact I just put together a list of stuff I’m going to need for a bunch of cocktails I’m planning to make, and its on the list. And this drink looks terrific! Nice and cool, and very refreshing. Good job – thanks. Glad to see you agree John, I can not deny I was both a bit surprised and delighted. This cocktail stuff can get pricey; knowing a good brand to use for mixing is a huge plus. I want to try their coconut rum too; sounds fun. This sounds very refreshing and I like rum! I have to admit that I’ve had their coconut rum and mixing it with pineapple juice it became a good pina colada. Now I am not a rum connoisseur, but it was quick and hit the spot on a hot day. That’s the one flavor I want to try Abbe; just sounds so perfect to me and wow…what an easy pina colada!